The suspension prompted weeks of court hearings in three states resulting in three legal reprieves that kept Elliott on the field. Dallas Cowboys running back Ezekiel Elliott is ending his legal fight with five games remaining on a six-game suspension over alleged domestic violence. Elliott's agents said on Wednesday the decision by last year's National Football League rushing leader "is in no way an admission of wrongdoing". Elliott had a hearing set in a federal appeals court on December 1, four games into the suspension. Wednesday was the 96th day since Commissioner Roger Goodell announced the suspension. Elliott served the first game in Dallas' 7-27 loss to Atlanta last weekend. By accepting the six-game ban, Elliott is eligible to return for the final two games of the regular season: December 24 at home against Seattle and December 31 at Philadelphia. The defending NFC East champions Cowboys (5-4) are three games behind the division-leading Eagles (8-1), who visit on Sunday night. A year after being the top seed in the NFC at 13-3, Dallas faces a difficult task staying in playoff contention until Elliott returns. The 22-year-old Elliott was suspended by Goodell in August after the league concluded following a yearlong investigation that he had several physical confrontations in the summer of 2016 with Tiffany Thompson, his girlfriend at the time. Prosecutors in Ohio didn't pursue the case, citing conflicting evidence. Elliott denied the allegations under oath during his NFL appeal. "Our vigilant fight on behalf of Ezekiel once again exposed the NFL's disciplinary process as a sham and a lie," the NFL Players Association said in a statement. "They hired several former federal prosecutors, brought in 'experts' and imposed a process with the stated goal of 'getting it right,' yet the management council refuses to step in and stop repeated manipulation of an already awful League-imposed system." The 2nd US Circuit Court of Appeals agreed to an expedited hearing for Elliott's arguments that he wasn't treated fairly by the league, but last week turned down his request for an injunction while the case was being heard. The same court ruled against New England quarterback Tom Brady last year over his four-game suspension in the "Deflategate" case. Unlike Elliott, Brady had won a lower-court ruling that delayed the suspension for a year. Dallas Cowboys running back Ezekiel Elliott celebrates scoring a touchdown in the third quarter of their NFL game against the Kansas City Chiefs at AT&T Stadium in this November 5, 2017, photo. "This decision arises from a practical assessment of the current legal landscape," agents Rocky Arceneaux and Frank Salzano said. "This decision is in no way an admission of any wrongdoing, and Mr Elliott is pleased that the legal fight ... resulted in disclosing many hidden truths regarding this matter, as well as publicly exposing the NFL's mismanagement of its disciplinary process." A Texas judge granted an injunction that kept Elliott eligible early in the season, agreeing with NFLPA lawyers who argued that investigators withheld key evidence from Goodell, and that the appeal hearing was unfair because arbitrator Harold Henderson refused to call Goodell and Thompson as witnesses. The NFL contended all along that the league followed federal law as it relates to labor agreements and the commissioner's power to discipline players. A federal appeals court in New Orleans tossed Elliott's lawsuit in Texas on the grounds that it was filed prematurely. The case moved to New York because the NFL had already filed there. After a visiting federal judge granted a temporary restraining order that kept Elliott on the field two more weeks, the judge assigned to the case rejected all of Elliott's arguments in denying his request for an injunction. An emergency stay made him eligible for one game against Kansas City before the latest ruling denying an injunction. "Mr Elliott's desire for closure is in his best interest, as well as the best interests of his teammates, family and friends," Elliott's attorneys said. "Mr Elliott will maximize his time away from the game and come back even stronger both on and off the field." The Dallas offense struggled without Elliott against the Falcons, finishing with a season low in points. Alfred Morris, who started in Elliott's place, had 53 yards on 11 carries. 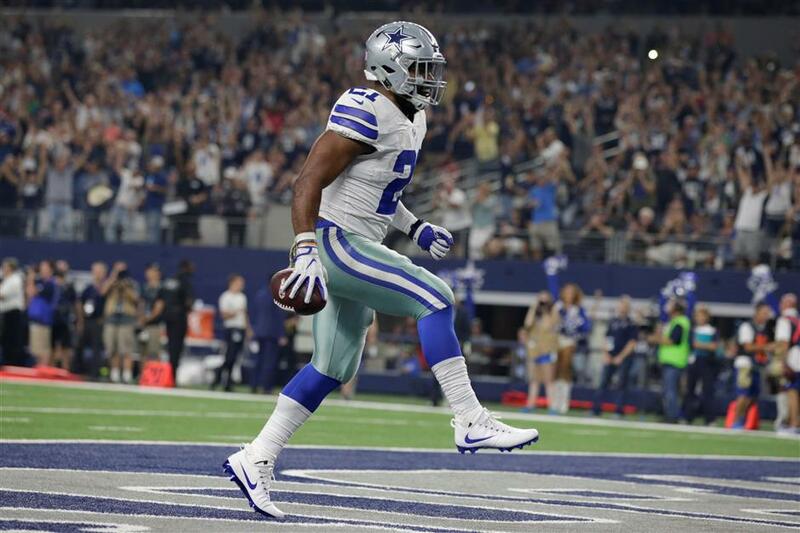 Elliott is third in the NFL with 783 yards rushing. "Like I said and continue to say, we trust those running backs that we have and what they'll do this Sunday," quarterback Dak Prescott said on Wednesday before Elliott's decision was announced.